The Bigelow Expandable Activity Module, known as BEAM, will remain attached to the International Space Station to provide additional performance data on expandable habitat technologies and enable new technology demonstrations. NASA awarded a sole-source contract to Bigelow Aerospace to support extension of the life of the privately-owned module, and its use to stow spare space station hardware. After NASA and Bigelow successfully completed collaborative analyses on BEAM life extension and stowage feasibility, astronauts began the process to provide additional storage capability aboard the station by removing hardware used for the initial BEAM expansion. They then converted sensors that monitor the BEAM environment from wireless to wired (to prevent interference from future stowage items on transmission of sensor data). Next they installed air ducting, netting, and large empty bags to define the stowage volume for hardware inside BEAM. NASA and Bigelow later will likely add a power and data interface to BEAM, which will allow additional technology demonstrations to take place for the duration of the partnership agreement. This new contract, which began in November, will run for a minimum of three years, with two options to extend for one additional year. At the end of the new contract, the agency may consider another extension or could again consider jettisoning BEAM from the station. The space inside BEAM will hold up to 130 Cargo Transfer Bags of in-orbit stowage. Long-term use of BEAM will enable NASA and Bigelow to gather additional performance data on the module’s structural integrity and thermal stability and resistance to space debris, radiation, and microbial growth, to help NASA advance and learn about expandable space habitat technology in low-Earth orbit for application toward future human exploration missions. Using BEAM for stowage will free up about 1.87 cubic feet (0.53 cubic meters) of space in other station modules for research. NASA’s use of BEAM as part of a human-rated system allows Bigelow Aerospace to demonstrate its technology for future commercial applications in low-Earth Orbit. Initial studies have shown that soft materials can perform as well as rigid materials for habitation volumes in space and that BEAM has performed as designed in resistance to space debris. BEAM launched on the eighth SpaceX Commercial Resupply Service mission in 2016. After being attached to the Tranquility Node using the station’s robotic Canadarm2, it was filled with air to expand it for a two-year test period to validate overall performance and capability of expandable habitats. Since the initial expansion, a suite of sensors installed by the crew automatically take measurements and monitor BEAM’s performance to help inform designs for future habitat systems. This extension will deepen NASA’s understanding of expandable space systems by making the BEAM a more operational element of the space station to be actively used in storage and crew operations. Space station crew members have entered BEAM more than a dozen times since its expansion in May 2016. The crew has conducted radiation shielding experiments, installed passive radiation badges called Radiation Area Monitors, and routinely collect microbial air and surface samples. These badges and samples are returned to Earth for standard microbial and radiation analysis at the Johnson Space Center. The public-private partnership between NASA and Bigelow supports NASA’s objective to develop deep space habitation capabilities for human missions beyond Earth orbit while fostering commercial capabilities for non-government applications to stimulate the growth of the space economy. 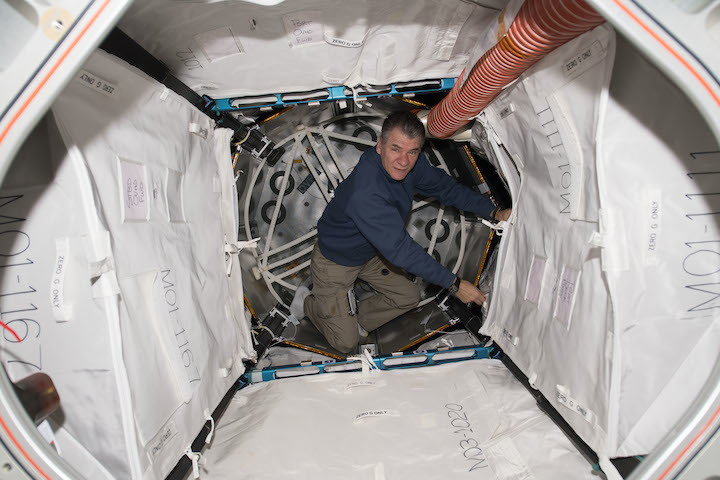 ESA (European Space Agency) astronaut Paolo Nespoli works inside the Bigelow Expandable Activity Module, or BEAM, outfitting it for future cargo storage aboard the International Space Station.